To commemorate Anne Frank and all the children killed in wars and conflict in this century. ‘It's utterly impossible for me to build my life on a foundation of chaos, suffering and death. I see the world being slowly transformed into a wilderness, I hear the approaching thunder that, one day, will destroy us too, I feel the suffering if millions... In the meantime, I must hold on to my ideals. Perhaps the day will come when I'll be able to realise them'. Anne Frank's diary 15 July 1944. 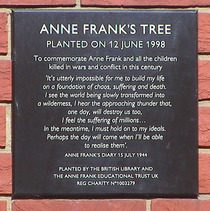 Planted by the British Library and the Anne Frank Educational Trust UK, reg. charity No 1003279. The tree itself is almost entirely lost, half buried in a modern planting scheme which gives priority to the high brick walls surrounding each area of greenery. 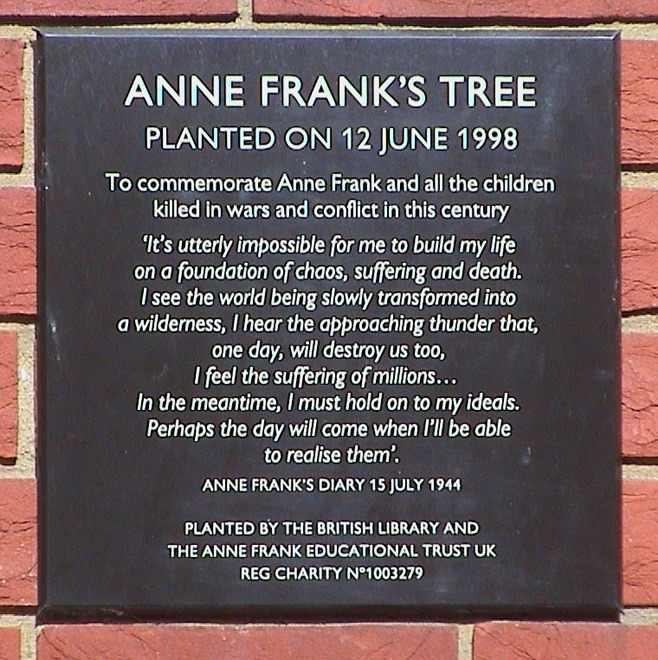 Prior to 2003 there was a statue of Anne Frank, by Doreen Kern (1999) in the forecourt. However it was subjected to vandalism so it was repaired and moved to the lower ground area, near the cloakroom.